Guys, there is so much to love about these amazing bars that I don’t even know where to begin. If I have to pick just one feature that makes them irresistible, it’s the chewiness factor. Yup, that’s what makes me keep going back for seconds and thirds and fourths! Oy vey! See, when the cornflakes mix with the peanut butter mixture, a sort of airy, honeycomb-like structure forms which melts in your mouth and still somehow manages to be chewy at the same time. Told you they were magic! Then of course, there’s the classic peanut butter/chocolate thing going on here. Do we really need to talk about that? And finally, though the last placement of this does not in any way diminish the importance of this, these bars are outrageously EASY TO MAKE!! Yes sirree, screamy, capital letter easy! 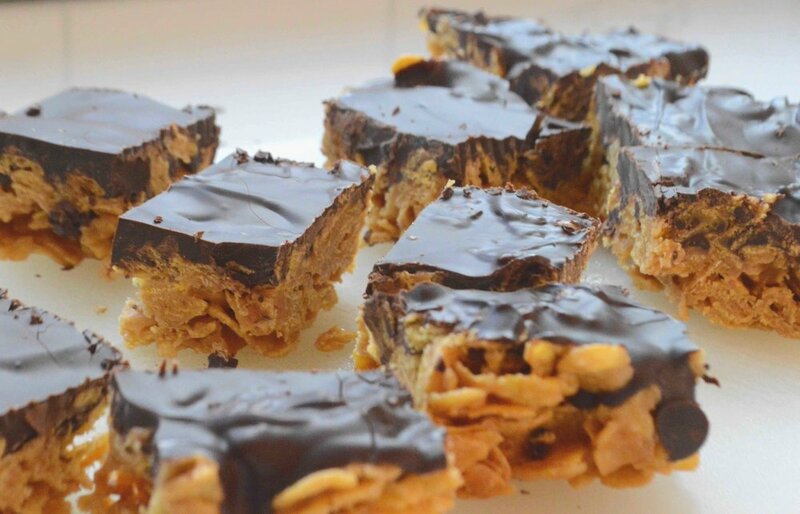 You just mix up peanut butter, honey, maple syrup and sugar in a pot (yes, you’re going to need to spend some extra time in the gym) pour over 6 cups of cornflakes and press the mixture into a baking dish. Then you cover the top in lots of lovely melted chocolate. When it comes to these bars, there’s only one truly hard part. You have to let these firm up and chill for at least 2 HOURS before cutting them into bars!! Agony, I know. But so, so worth the wait! Every bite is a peanutty, chocolate-y, chewy, glorious delight! I promise these will be the hit of the party, but don’t take my word for it. Try them yourself and there will be great happiness—no matter how your team performs!! 1. Spray a 9 x13-inch pan with cooking spray and set aside. 2. Place the cornflakes in a very large bowl and set aside. 3. In a medium pot, combine the peanut butter, honey, maple syrup and sugar. Heat over medium heat, stirring until the sugar has dissolved and the mixture starts to get bubbly, about 5 minutes. Watch carefully and scrape the sides because you don’t want it to burn. Working quickly and carefully, pour the hot mixture over the cornflakes and mix together well. Spread the mixture into the prepared pan and push it down and around so that it’s as even as possible. 4. Melt the chips in the microwave or in a small pot over low heat, stirring until smooth. 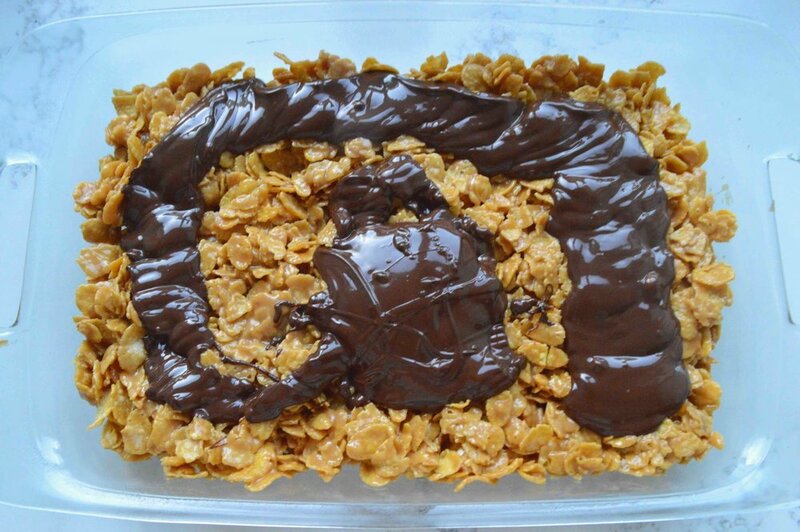 Pour over the cornflake mixture in the pan and spread out evenly across the top. Cover with plastic wrap and chill in the fridge for at least 2 hours until the chocolate is firm. Remove about 10 minutes before you want to cut them (it’ll help them cut more neatly) and then use a sharp knife to cut into bars. Store in the fridge until ready to serve. 5. These are reputed to last at least a week in the fridge in an airtight container but that may be a myth. Any leftovers will be scarfed up much sooner than that! Note: Recipe from Half Baked Harvest Cookbook by Tieghan Gerard. I subbed in crunchy peanut butter for the creamy and used bittersweet chocolate chips instead of semisweet.